Seen by over 9 million people in more than 250 cities around the world, WALKING WITH DINOSAURS - The Arena Spectacular, is back. Starring Michaela Strachan* be amazed and thrilled as the greatest creatures ever to walk the earth return before your eyes. The show will be returning to Sheffield for 4 performances at the FlyDSA Arena on Friday 10th & Saturday 11th August 2018. Tickets, priced £28, £39.20 &; £50.40 including booking fee, are on sale now from www.flydsaarena.co.uk , 0114 256 56 56 or in person from the Arena Box Office. 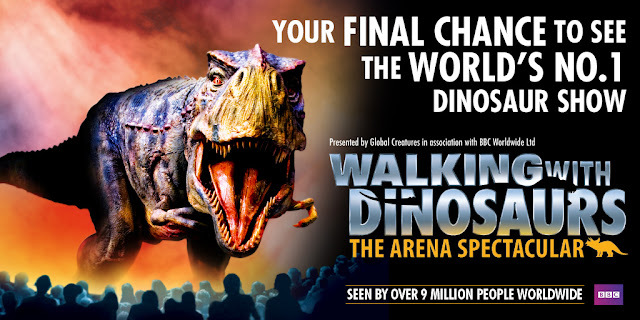 The dazzling $20 million production features new, state of the art technology, making this the biggest and best dinosaur show in the world. Internationally renowned designers have worked with scientists to create 18 life-size creatures, including the Stegosaurus, Raptors, and the terrifying Tyrannosaurus rex! To be in with a chance of winning a family ticket to walking with dinosaurs at the FlyDSA arena in Sheffield, follow the instructions below. The family ticket is for Friday 10th August 7pm show.